Sky maintains an electronic programme guide (EPG) which provides information about upcoming programmes and a list of channels. Channels available on Sky are assigned a three-digit logical channel number which can be entered on a remote control to access the channel and determines in what order channels are listed. For example, this ensures that viewers get access to the correct BBC or ITV region or that S4C gets a prominent listing in Wales. All channels are grouped into categories depending on their content. What section of the EPG a channel gets allocated is determined by rules set up by BSkyB. BSkyB has no veto over the presence of channels on their EPG, with open access being an enforced part of their operating licence from Ofcom. Any channel which can get carriage on a suitable beam of a satellite at 28° East is entitled to access to BSkyB’s EPG for a fee, ranging from £15–100,000. Third-party channels which opt for encryption receive discounts ranging from reduced price to free EPG entries, free carriage on a BSkyB leased transponder or actual payment for being carried. However, even in this case, BSkyB does not carry any control over the channel’s content or carriage issues such as picture quality. In October 2007, BSkyB announced that they would not accept new applications to launch channels on their EPG, citing “very significant memory constraints” on many of its older Digiboxes. 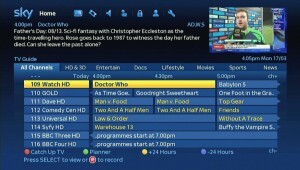 In June 2012, BSkyB launched a new EPG for Sky+ HD boxes. The update boasts a new modernised look and improved functionality. Sky Go is an online television service from Sky which launched in January 2006. The service allows users to watch live and on-demand video content from their Mac, Windows PC, mobile phone, Xbox 360, PlayStation 3 or PlayStation 4 via a broadband or Wi-Fi internet connection. On-demand content comprises sports highlights, the latest news, movies and TV programmes. Content is viewable for a limited amount of time and is protected by digital rights management software provided by Microsoft and the NDS Group, and therefore cannot be copied to disc or viewed beyond the date carried by its license. The service is available at no extra cost to existing Sky TV customers, with accessible content depending on the subscriber’s Sky package. Non-Sky TV customers can access the service by subscribing on a pay-per-view basis. Sky Go is viewable on up to two devices, with the ability to increase this to four devices with Sky Go Extra for a monthly fee. The Microsoft Silverlight 3.0 browser plug-in is required to play content on computers. Due to viewing rights, certain programmes are not available to watch via Sky Go, and are ‘blacked out’ from the schedule. To have access to the full selection of live TV channels available on Sky Go, users will need a subscription to the relevant TV packages that correspond to the available channels. 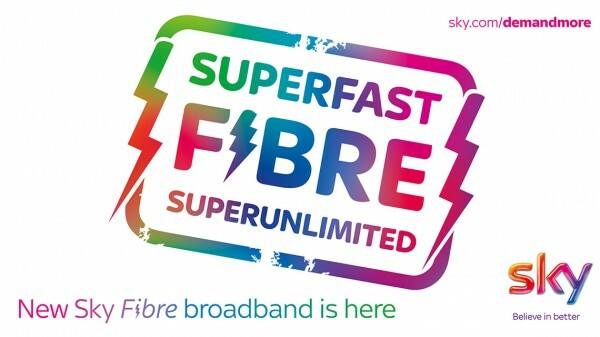 Sky Broadband provides Sky customers with download speeds of up to 20Mbit/s (ADSL2+ from Sky enabled exchanges, by means of LLU) and up to 76Mbit/s from exchanges enabled for FTTC via an Openreach landline (often still referred to as a BT line). 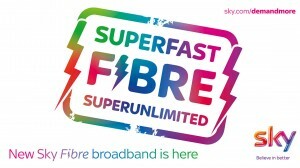 Sky also has free broadband and calls package for its TV subscribers within the Sky Broadband network area. This means anyone on Sky can get free broadband (subject to a 2GB/month usage limit) and free evening & weekend telephone calls, as long as the line is in a Sky Broadband network area. For customers whose exchange has not been enabled for the above services, the Connect service is available using the BT Wholesale ADSL Max network. As with all DSL connections, the further the distance from the DSLAM (usually located at the telephone exchange) the customer site is, the slower the line speed will be. Sky use DLM (Dynamic Line Management) over the first 10 days of a new connection to set the line at an acceptable downstream and upstream speed in order for the connection to remain stable. Lines are initially connected at 4Mbit/s and gradually increased over the 10 day “training period” until the line shows signs of instability, this allows Sky to know what speeds the line can handle whilst remaining stable. The Sky Wireless Hub is a wireless router distributed to all Sky Broadband customers when they order their Sky Broadband packages. Sky has created On Demand, which will combine Sky Broadband and Sky+ HD to offer a true on-demand service using the Ethernet socket of the Sky+ HD box and the Sky Broadband router. 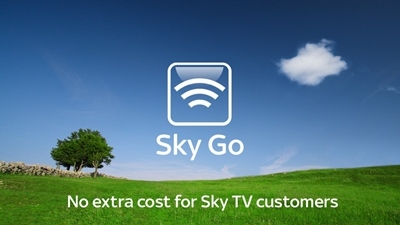 Sky Customers will be able to connect their Sky router to their Sky+ HD box via an Ethernet cable or Wi-Fi adapter, and stream content directly to their television. Unlike other VOD services, On Demand video will count towards a users data usage.